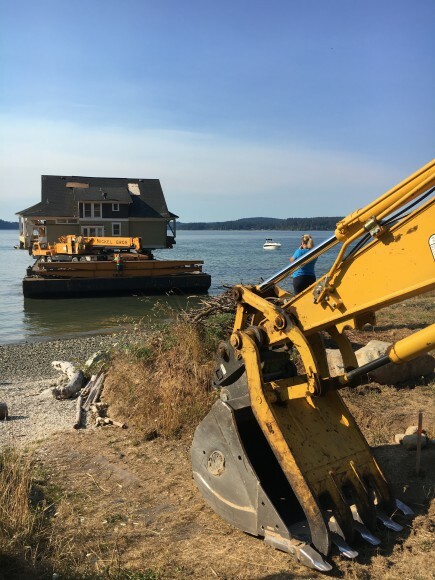 A couple of weeks ago, on a classic, sunny August day, before their September 1st demolition deadline, clients of mine watched from a small boat as their home traveled on a large barge from Lake Washington, through the Ballard Locks, to its new home here on the west side of Bainbridge Island. Yes, when you really, really want a low bank waterfront home and you can’t find one, well, you can just move one. That’s what my clients did anyway. It is indeed easier said than done, but, they are not alone in this house moving business. Living on an island means barging a home is actually feasible here. In the almost ten years I have been here, I have seen three homes barged to or around the island. It is quite the engineering feat. One I was pretty thrilled to witness up close. But, let me know back up. My clients had looked for a home in earnest for well over a year. Finally, a low bank waterfront piece of land near Battle Point Park with Olympic Mountain Views and western exposure became the place they wanted to raise their family. 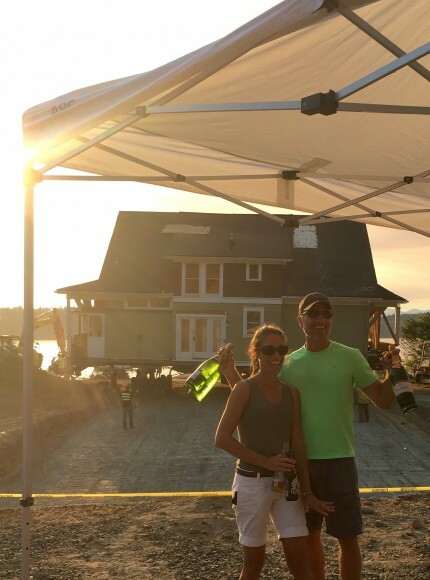 But, the lot had no viable home and the land price for the low bank waterfront lot alone did not make building a new custom home feasible for them. 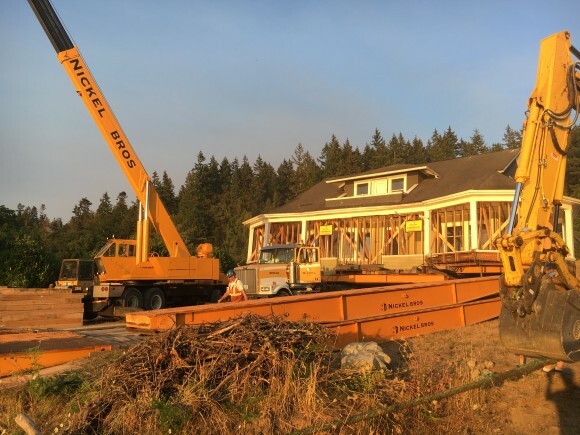 They had already become familiar with Nickel Bros, the go to home barger in the PacificNorthwest, and while we were in escrow on the lot, this nicely sized Craftsman home came up on the Nickel Bros website for sale. My clients liked the idea of living in an older home and really liked the “recycled” home concept. If a home is not purchased from Nickel Bros, it is demolished. My clients felt this home was too special and had too much character to be demolished. They soon secured it and we spent the next six months purchasing the land (a septic easement had to be created and a well drilled). My clients then spent the next the summer months doing their site plan and getting the foundation ready for the home. If you are not familiar with the barging process, know that homes that get moved are purchased for $1 and then the cost comes in the barging and moving of the home itself. I have seen barging costs that range from $60K to $800K, it all depends on the difficulty of the homes and sites. My clients are thrilled to have their home on their land and will spend the coming months doing an addition that includes a bump out and a full basement. 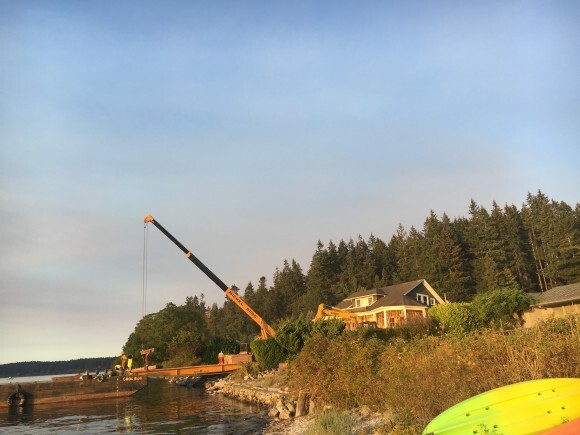 They are working with a builder on the island Ray Stevenson of Jefferson Fine Homebuilders, who has been involved in several other barged home projects. I can’t wait to see the finished product.